The trailblazing prototype for the space shuttle fleet, the Enterprise, was hauled Friday atop a modified Boeing 747 to New York City where it will become a new exhibit aboard the Intrepid Sea, Air & Space Museum, a vintage aircraft carrier turned museum anchored in the Hudson River. The most-flown spaceship in human history, sailing on 39 voyages to deploy and retrieve satellites, open a new window on the universe by launching the Hubble Space Telescope and help to construct the International Space Station, the shuttle orbiter Discovery reached her final resting place Thursday at the Smithsonian. The space shuttle orbiter Discovery, part of Kennedy Space Center's heart and soul for three decades, departed the Florida spaceport forever Tuesday morning en route to become a museum exhibit at the Smithsonian's annex in Northern Virginia. Now perched atop the Shuttle Carrier Aircraft, Discovery emerged from the crane gantry this morning to spend the final day at the place she called home for three decades. A windy Saturday morning interview with Stephanie Stilson, a long-time space shuttle Discovery official at Kennedy Space Center and now manager of all the orbiters' retirement activities. The very same aircraft that delivered Discovery from her California manufacturing plant in Palmdale to the Kennedy Space Center in 1983 was topped by the orbiter Sunday morning to prepare for Tuesday's ferryflight to the orbiter's museum display site outside Washington, D.C.
Talk about access! Space shuttle fans have a unique opportunity to buy front-row seats at Kennedy Space Center's runway to watch Discovery depart the spaceport atop the 747 carrier jet Tuesday morning. In the predawn darkness Saturday, the shuttle Discovery moved ever closer to leaving her home port forever as remaining technicians towed the decommissioned spaceplane to the runway ramp for mounting atop the 747 carrier jet. However, strong winds stalled plans to hoist the orbiter off the ground until Sunday. The modified Boeing 747 jumbojet that will haul the space shuttle Discovery piggyback-style to the Smithsonian next week flew across the country to Kennedy Space Center on Tuesday to pick up the spaceplane passenger. Exactly one year to the day since returning from her final spaceflight and now ready for public display at the Smithsonian, the most-flown space shuttle orbiter was rolled from the Kennedy Space Center hangar and placed into temporary storage at the Vehicle Assembly Building today. When the shuttle Discovery swooped back to the Kennedy Space Center a year ago Friday to conclude the spaceship's flying days, commander Steve Lindsey was dealt some of the most challenging weather conditions ever experienced during an orbiter landing. These slow-motion films capture the awe-inspiring sight of a space shuttle blasting off from the Kennedy Space Center on one of the program's final missions, Discovery soaring skyward in February headed for the International Space Station. The amazing videos are presented here for Spaceflight Now+Plus users. The space shuttle Discovery, undergoing her retirement and transition to museum status at the Kennedy Space Center, has been outfitted with hollowed thruster and rocket pods, replicas of the main engines, the payload bay doors sealed up and the emotional moment of being powered down for the final time. We take a look back at all of those events in this video package presented for Spaceflight Now+Plus users. The aerodynamic tail cone to cover space shuttle Discovery's main engines and provide a smooth airflow during the piggyback ride atop the modified Boeing 747 carrier jet to the Smithsonian in April was installed onto the orbiter this week. After deploying 21 satellites from expansive confines, including the Hubble Space Telescope, commercial spacecraft and military eavesdroppers, hosting scientific platforms and hauling key pieces of the International Space Station, the payload bay of space shuttle Discovery was closed and locked as the spacecraft was powered off for the final time Friday. In preparation for displaying the space shuttle Discovery at the Smithsonian's National Air and Space Museum Steven F. Udvar-Hazy Center, technicians began installing replica main engines on Monday. Two space shuttle orbiters swapped places at the Kennedy Space Center on Thursday as NASA prepares the retired spaceships for public display in museums. The unique morning climaxed with a nose-to-nose photo opportunity with Discovery and Endeavour. The space shuttle Discovery on Wednesday morning made her first public appearance outside the hangar since being retired, emerging without any main engines, nose thrusters or aft rocket pods. Seeing the stripped down orbiter with a gaping hole in the nose was a harsh reminder that the spaceship's flying days are over. NASA Administrator Charles Bolden unveiled which museums will house the retired space shuttle vehicles during a ceremony Tuesday on the 30th anniversary of the program's first launching. The future homes are: Discovery to the Smithsonian's National Air and Space Museum, Atlantis to the Kennedy Space Center, Endeavour to California Science Center in Los Angeles and Enterprise to the Intrepid Sea, Air & Space Museum in New York City. The cryogenic powerplants that propelled space shuttle Discovery on her final eight-and-a-half minute climb to orbit last month were removed from the spacecraft this week. Here's some photo galleries of the three-day process. And so it begins. Technicians at the Kennedy Space Center have begun taking apart the shuttle Discovery, the ship now a laboratory specimen for engineering forensics before her future date with a museum. The shuttle Discovery made a graceful landing at Kennedy Space Center, returning from her final voyage after a remarkable three-decade life of service spanning 39 flights, 5,830 orbits of the planet, 365 days spent aloft and 148 million miles traveled. Discovery becomes NASA's first orbiter retired as the space shuttle fades into history over the next few months. MISSION STATUS CENTER - live updates and streaming video! On the eve of returning to Earth to close out the shuttle Discovery's 39th and final flight, the ship's crew said the nation should be proud of the shuttle program's accomplishments, but expressed concern that a replacement vehicle is not waiting in the wings to replace it. The crew of the shuttle Discovery, awakened by actor William Shatner reading a "Star Trek" tribute marking the veteran spaceplane's final voyage, undocked from the International Space Station at 7 a.m. EST Monday to close out an extended assembly and resupply visit. The orbiter is scheduled to land on Wednesday. A humanoid robot delivered to the space station by the shuttle Discovery should come out of its packing crate by the end of March, and ground crews could start tinkering with the Robonaut soon after. But it could be months before NASA trusts the robot to help astronauts do chores on the complex. After transferring a final few items to and from the International Space Station -- and enjoying a bit of zero-gravity fun in a roomy new storage module -- the Discovery astronauts bid their station colleagues farewell Sunday, floating back aboard the orbiter to rig the ship for undocking early Monday to wrap up this shuttle's final visit. The Discovery astronauts Friday focused on unloading the newly attached Permanent Multipurpose Module, moving science gear and other equipment into the International Space Station and transferring packing material and unneeded gear to a Japanese cargo ship for disposal at the end of the month. Onboard rocket camera footage always dazzles and the video from Discovery's external fuel tank and solid boosters didn't disappoint during the afternoon blastoff last week. A camera mounted in the pilot's window looking outward also provides an amazing view of the spacecraft rocketing toward orbit, which is presented here for Spaceflight Now+Plus users with launch audio. The Discovery astronauts worked through a busy morning in space Thursday, took the afternoon off and enjoyed a long-distance call from President Barack Obama, who praised NASA's oldest shuttle for a "critical and iconic" final flight to the International Space Station. NASA managers, meanwhile, decided to extend Discovery's mission a second day to give the crew more time to help unload a newly attached storage module. Venturing outdoors from the International Space Station on Wednesday for their second of two EVAs during shuttle Discovery's mission, spacewalkers Steve Bowen and Al Drew successfully accomplished a long list of maintenance chores. The assorted collection of odds and ends was described as "cats and dogs but no elephants" because none of the various tasks were major. An Italian-made module that will give the International Space Station a bonus room to help ease the outpost's storage woes was successfully installed Tuesday while flying 220 miles over the Sahara. The vessel is the modified Leonardo reusable cargo van that had visited the station seven times, but now it's a permanent fixture. Astronauts Steve Bowen and Al Drew went outside the International Space Station on Monday to accomplish last summer's leftover work of packing away a failed cooling pump and routing a power extension cable. Everything planned was accomplished during the 6-hour, 34-minute EVA that began early at 10:46 a.m. EST (1546 GMT) and concluded at 5:20 p.m. EST (2220 GMT). The Discovery astronauts worked through a busy day of robot arm activity Sunday, along with equipment transfers to the International Space Station and preparations for a spacewalk Monday by astronauts Al Drew and Steve Bowen, the first of two planned for the shuttle's final mission. Sailing in orbit on her last mission, Discovery arrived at the International Space Station on Saturday for a week-long stay to prepare the outpost for life after the space shuttles are retired. Just hours after docking, an outdoor pallet for stockpiling spare parts was hoisted from the shuttle payload bay and delivered to the station. The Discovery astronauts have spent their first full day in space inspecting the shuttle's nose cap and wing leading edge panels for standard post-launch heat shield checks, testing equipment needed for upcoming spacewalks and preparing for Saturday's docking to the International Space Station. IMAGES: EVEN MORE LAUNCH PICTURES! The shuttle Discovery weighed anchor from the Florida spaceport and set sail on her final voyage at 4:53 p.m. EST (2153 GMT) Thursday, embarking with six astronauts for an 11-day journey to bring one last module to the International Space Station. NASA managers have given the "go" to launch shuttle Discovery next Thursday on a long-delayed space station resupply mission after an exhaustive review of ground processing and unprecedented external tank repairs to fix and prevent potentially dangerous cracks in the ship's external tank like those that derailed a launch try last November. With the external tank repaired and strengthened, the space shuttle Discovery re-emerged from the Vehicle Assembly Building and returned to launch pad 39A overnight for a final pre-retirement mission to the International Space Station. Rollout began at 7:58 p.m. (0058 GMT) and was completed at 2:53 a.m. EST (0753 GMT). Engineers believe they have zeroed in on the root cause of cracks in the shuttle Discovery's external tank, NASA officials said Tuesday. Installation of a relatively simple modification to the tops of the structural ribs, or stringers, where the ship's liquid oxygen tank is supported by a massive flange should resolve the problem once and for all, setting the stage for another launch attempt Feb. 24. Senior NASA managers Monday agreed to install stiffeners all the way around the shuttle Discovery's external tank to beef up structural ribs, or stringers, that are susceptible to cracks when exposed to ultra-low-temperature propellant. Engineers say the modifications can be completed in time to support at launch as early as Feb. 24, assuming the work goes smoothly and no other major problems develop. NASA managers Monday directed engineers to add stiffeners to some structural beams in the shuttle Discovery's external tank. Another meeting is planned for Thursday to discuss installing so called "radius-block" stiffeners to the tops of the remaining stringers that form the tank's familiar ribbed midsection, but work to beef up all 108 almost certainly would delay Discovery's launch to late February. Leaving the launch pad and rolling back to the Vehicle Assembly Building early Wednesday, the space shuttle Discovery will spend the holidays having the external tank digitally X-rayed as engineers look to prove the hypothesis that its structural cracks resulted from pent up stresses accumulated during construction and were unleashed during the strains of cryogenic fueling. The space shuttle Discovery's external tank was loaded with a half-million gallons of supercold liquid oxygen and hydrogen rocket fuel Friday for a knowledge-building test to understand the stresses and strains the external tank endures during a countdown. The shuttle will be rolled back to the Vehicle Assembly Building on Tuesday for detailed inspections. Launch of the shuttle Discovery on a space station resupply mission will be delayed until at least Feb. 3, NASA managers announced Friday, to give engineers more time to carry out tests to help figure out what caused cracks in the ship's external tank and what, if any, modifications might be needed before the ship can be cleared for flight. NASA managers and engineers met Thursday to discuss the potential root cause of cracks in the shuttle Discovery's external tank, what additional tests might be needed and what, if any, modifications might be required before another launch attempt can be made. NASA managers reviewing the progress of repairs to the shuttle Discovery's external tank and the rationale for making another launch attempt decided Wednesday to pass up an early December launch window, delaying the flight to at least Dec. 17 and possibly all the way to February. Engineers are pressing ahead with work to repair small cracks in the shuttle Discovery's external tank and to finish installation and tests of a replacement hydrogen vent line quick-disconnect fitting that grounded the ship Nov. 5. At the same time, troubleshooters are assessing the structural integrity of the tank and its foam insulation to develop the necessary flight rationale, or justification, for proceeding with another launch as early as Nov. 30. Engineers inspecting the shuttle Discovery's external tank have found a fourth crack in the structural ribs, or stringers, making up the outer skin of the compartment between the liquid oxygen and hydrogen sections. Engineers removed additional foam insulation near a cracked structural rib, or stringer, in the shuttle Discovery's external tank Friday and found yet another crack in an adjacent stringer, sources said. A leaking hydrogen vent line attachment fitting on the side of the shuttle Discovery's external tank was removed and disassembled overnight, revealing an unevenly compressed internal seal. The quick-disconnect hardware also may have a less concentric fit than pre-fueling measurements indicated. Cracked foam insulation on the shuttle Discovery's external tank was cut away early Wednesday, revealing serpentine cracks in an underlying structural rib, or stringer. Based on experience repairing similar cracks on other tanks, sources said, engineers believe the damage can be fixed at the pad before the next launch window opens at the end of the month. Engineers worked to disconnect a 7-inch hydrogen vent line from a leaky quick-disconnect fitting on the side of the shuttle Discovery's external tank Tuesday that grounded the ship last Friday. Disassembly of the suspect fitting was expected overnight, with troubleshooters taking in situ photographs of the hardware, double-checking its alignment and looking for any obvious signs of trouble. Engineers extended a launch pad access platform Monday in preparation for inspections and disassembly of a 7-inch hydrogen vent line quick-disconnect fitting to find out what caused a potentially dangerous leak that forced NASA to cancel the shuttle Discovery's planned launching last Friday. Friday's liftoff of space shuttle Discovery has been postponed due to a "significant" leak in the gaseous hydrogen venting system between the launch pad and external fuel tank. It's the same problem that delayed a pair of shuttle missions last year. NASA says the next launch attempt won't be made until the next window opens on November 30 at 4:05 a.m. EST. The Mission Management Team met early Thursday morning and decided the weather conditions at Kennedy Space Center were too unfavorable to attempt launching space shuttle Discovery that day. The countdown will hold for 24 hours and retarget a liftoff on Friday at 3:04 p.m. EDT (1904 GMT). Wednesday's planned launch of space shuttle Discovery has been postponed at least 24 hours to give technicians additional time for troubleshooting the electrical problem with the main engine controller circuitry. A Thursday liftoff would be targeted for 3:29 p.m. EDT (1929 GMT). The shuttle Discovery and a crew of six veteran astronauts are on track for launch Wednesday to deliver critical spare parts, supplies and a final U.S. module to the International Space Station. It will be Discovery's 39th and final voyage as NASA presses ahead with plans to retire the fleet after just three more missions. This is our 4,300-word mission preview. Having resolved helium and nitrogen leaks, space shuttle Discovery's final launch countdown started this afternoon at Kennedy Space Center's Complex 39. Liftoff is targeted for Wednesday at 3:52 p.m. EDT (1752 GMT). Shuttle managers have decided to push back Discovery's launch an additional 24 hours, enabling technicians time to complete testing and the pressurization of Discovery's helium system before starting the countdown sequence. Liftoff is rescheduled for Wednesday at 3:52 p.m. EDT (1752 GMT). The Expedition 25 crew working aboard the International Space Station has used the outpost's seven-windowed cupola to take amazing nighttime pictures of planet Earth. The orbital observation deck offers panoramic views for the astronaut shutterbugs to wow the public in these photos of America, Europe, Africa and the Middle East. The shuttle Discovery's launch on a space station resupply mission is being delayed from Monday to at least Tuesday -- election day in the United States -- to give engineers time to repair two leaking quick-disconnect fittings in pressurization systems used by the ship's right-side orbital maneuvering system rocket pod. Repairs will delay starting the countdown sequence until Saturday, pushing back Discovery's launch to Tuesday at 4:17 p.m. EDT. Six astronauts traveled from their home base in Houston to the Kennedy Space Center launch site in sleek T-38 jets Thursday afternoon, trained and ready to take shuttle Discovery for its final spaceflight. Launch remains scheduled for Monday at 4:40 p.m. EDT. After reviewing normal processing and weekend work to fix a small fuel leak, NASA managers Monday cleared the shuttle Discovery for an election-eve launch November 1 to begin a space station resupply mission, the orbiter's 39th and final flight. Working through the weekend, engineers drained toxic propellants from the shuttle Discovery's orbital maneuvering system rocket pods, dried out the lines, disassembled a fuel-line flange Saturday and replaced two internal seals in a bid to stop a tiny leak. Engineers geared up Thursday to drain toxic rocket fuel from the shuttle Discovery's orbital maneuvering system rocket pods before beginning weekend work to replace suspect seals in a fuel-line flange. Space shuttle Discovery's astronauts Wednesday took turns test-driving an armored tank around Complex 39 as part of their emergency training exercises in the Terminal Countdown Demonstration Test. The six astronauts to fly Discovery's final orbital voyage have jetted into the Kennedy Space Center for this week's countdown dress rehearsal with the space shuttle launch team. An Italian-made module that will give the International Space Station a float-in closet and help ease the outpost's storage woes arrived at the launch pad Thursday morning for loading aboard space shuttle Discovery. The Express Logistics Carrier No. 4 for the International Space Station was loaded into the transportation canister at Kennedy Space Center this morning, bound for shipment to shuttle Discovery at launch pad 39A. Workers installed the shuttle Discovery's right-side Orbital Maneuvering System pod Thursday at the Kennedy Space Center after replacing a faulty helium valve. With only two shuttle flights remaining on NASA's manifest, prime contractor United Space Alliance plans to lay off about 15 percent of its 8,100-strong space shuttle workforce Oct. 1, company officials announced Tuesday. After assessing payload processing issues and projected traffic to and from the International Space Station, NASA managers Thursday formally retargeted the program's final two missions for launches Nov. 1 and Feb. 26. Three main engines were attached to the shuttle Discovery earlier this week to power the orbiter's last launch this fall. Spaceflight Now captured these views of the task of installing the hydrogen-fueled engines on the back of the shuttle. The oil slick threatening the Gulf Coast is throwing a wrench into NASA's plans to transport a new shuttle fuel tank from Louisiana to Florida this week. 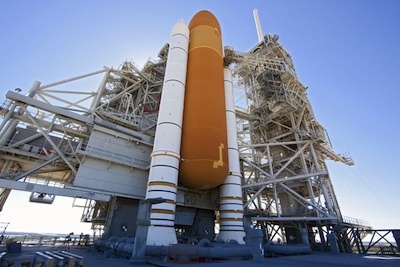 The external tank will fly on the shuttle Discovery's mission in September.